For some fans, watching a game in a great sports bar is the only way to go. TV frequently provides much better views that you get at the stadium, and you're not limited to over-priced stadium food and drinks. Add the electricity of watching the game with other fans, without having to clean up after your sloppy friends, and you're good to go. Here's a quick list of some of Sonoma County's best sports shrines. The TVs are front and center at this stylish bar managed by celebrity chef Douglas Keane. Besides local beers on tap, the popular, always busy restaurant has great food – Food & Wine magazine includes it on their “25 Best Burgers in the U.S. list.” You can sure taste the quality - the pickles are homemade, and the fish ‘n’ chips are beer batter dipped. This legendary hangout is famous for its uproariously popular Pliny the Younger release each year. Yet every day, brewmaster and owner Vinnie Cilurzo also offers up traditional (think aggressively hopped) California-style ales, Belgian inspired ales, lagers, and barrel-aged beers. Just a few of the year-round specialties include Blind Pig, Damnation, Pliny the Elder, Beatification, and Consecration. You can sip at the recently remodeled bar, order suds samplers off the chalkboard, listen to rousing music, and dive into top notch fare like a meatball sandwich or hearty calzone. Start with the four large TVs, add in multiple dartboards, a pool table, 32 beers on tap, a pinball machine, table games and free popcorn, and you’re in for a party. This dark, cozy pub is festive all around, and a true locals’ hideaway. There are two locations, in downtown Sonoma and downtown Sebastopol, and the bars boast TVs next to Hopmonk’s own beers on tap, plus many beers by the bottle from around the world. It’s dark and cocoonish inside, just the thing to concentrate on the game, but you can stretch your legs in the large outdoor dining areas and beer gardens, too. Plan to eat well, from an extensive menu ranging from ploughman’s platter to tacos to cider glazed salmon. The Victorian parlor mood somehow works wonderfully with this classic pub anchored by a big screen TV, and amenities like an antique polished bar, a pool room, and a mostly local clientele. 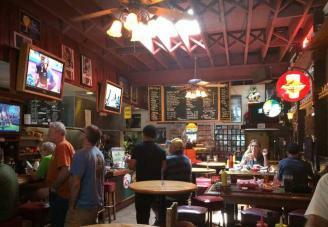 The Saloon features wine country comfort food and what fans claim is the best burger in Sonoma. Then, chill out on the patio overlooking Sonoma Creek. Cold beer, peanuts, TVs all around – does it get better? The dark, clubby saloon bar is popular with real sports fanatics, who aren’t afraid to get loud. When the hunger pangs hit, be sure to get a burger and sweet potato fries, extra-delicious with the signature bacon Bloody Mary. This new gem encourages playtime with a collection of board games sitting beneath the television. 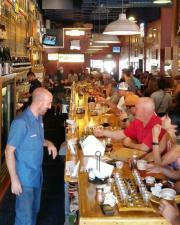 But the real draw is the beer, with brewers Paul Hawley and Remy Martin using exclusively California-grown hops. The urban hip taphouse puts forth signature sips like Atlas Blonde (“light and crisp with a fruity hop aroma”), Del Norte IPA (“hop driven with a malty finish”), and Armstrong Stout (“rich with flavors of chocolate and coffee but finishes light and balanced”). Ask for perfect pairings with the extensive food menu, too, tempting with signatures like local charcuterie, sausage and cheese boards, gourmet sandwiches and mac ‘n’ cheese. This cheerful sports bar and upscale eatery woos with uncommon plates like Brussels sprouts tacos, potato nachos, and truffle burgers. To go with: an excellent selection of beers, including sampler flights, a wide array on tap, bottled locals and imports, and even gluten-free brews. Sit at the bar for the best TV views. Being the newest sports bar in Sonoma County, The Epicenter in Santa Rosa is also the largest indoor sports & entertainment complex on the West Coast. It includes a health club, Rockin' Jump trampoline park, arena sports centers, basketball courts and indoor soccer courts, 7Ten Social bowling alley, arcade and even laser tag! Their sports bar and restaurant, Victory House, is the perfect place to grab a beer from their 24 taps and watch the game (or games) from their two 40-foot walls of HD TV Sceens.